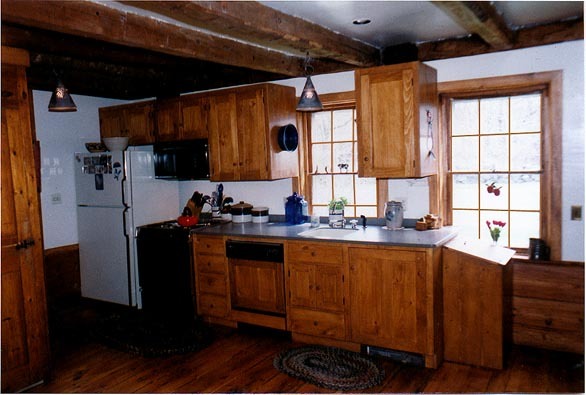 The single story wing of this 18th Century colonial contained the original kitchen with brick hearth and oven and an attached unfinished back room with a loft and outhouse shed. In the kitchen we removed the modern cabinets and under several layers of finish ceilings we found a beautiful set of hewn ceiling beams and a unique counterweighted pulley system for drawing water from the old well beneath the floor. The new pine cabinets were built and finished to match the existing woodwork. The floor of the back room was rebuilt and a new finish floor of antique boards was laid. The back of the old beehive oven was left exposed and the room was finished for use as home office.